The private sector is under increasing pressure to address the financial risks of climate change. At the same time, opportunities for low-carbon economic growth are becoming more attractive to potential investors, especially in scaling up renewable energy (in particular, solar and wind power), retrofitting coal power plants to burn natural gas, and improving the energy efficiency of buildings and industrial processes. Many of these opportunities could provide substantial economic benefits while decreasing greenhouse gas emissions. However, the economy-wide emergence of opportunities clouds the challenges faced by individual actors. The case of NRG Energy and its attempts to scale up its use of renewable energy illustrates how investors can hold CEOs back even when the economic incentives exist. Government policy could help the private sector to invest in low-carbon opportunities without being penalized by stakeholders. An increasingly popular assertion of the environmental movement today is that companies no longer have to choose between doing what’s good for their business and what’s right for the planet and its people. It seems that a confluence of circumstances has led to “sustainability” being promoted as good business sense. It isn’t just the campaigners—companies themselves are jumping on board too. Indeed, many companies that have overhauled their practices to be more responsible have saved money and improved their performance. From Unilever to IKEA, a generation of enlightened CEOs seems to be stepping out of the shadows and asserting that doing well and doing good are not mutually exclusive. “There is overwhelming evidence that the way in which companies go about their business is becoming more important than ever,”  writes David Jones in his 2011 book Who Cares Wins, which argues that companies need to behave ethically in order to be successful. His book is one example in a crusade to transform business into a force for good in the world. Increasingly, companies have made efforts to integrate sustainability practices and ethical behavior into the fabric of their corporate identity, rather than to treat them as separate CSR initiatives whose purpose is to serve as counterweights against the transgressions of traditional business models. Among all the success stories, one company provides a lesson in caution: NRG Energy—a Fortune 200 energy provider that arguably ranks among the most environmentally progressive energy companies in the world. It features a purpose-driven CEO who sees climate change as the most important threat that the world faces today and in the future. NRG has invested heavily in growing low-carbon alternatives to fossil fuels, especially solar, wind, and natural gas  (which, despite being high-carbon in comparison with renewables, is still preferable to coal). It has been six years since NRG launched its flagship sustainability initiative, and the results are beginning to show. But recently, NRG’s performance has suffered. In the past five years, its stock has mostly tracked the performance of the S&P 500 (of which it is a component) with the exception of a disappointing period in 2012, from which it recovered by the end of the year. In the past two years, though, its share price has decoupled from indices, plummeting from a 5-year high in June 2014 to lose around two-thirds of its value  (Figures 1 and 2[6). Source: Author’s chart with data from Yahoo! Finance 2015. The key question in this case is whether Mr. Crane’s push to decarbonize his company is related to NRG’s lagging performance. Superficially, it would seem unnecessary that NRG’s performance would suffer as a result of the transition. The consumer mostly doesn’t see what Mr. Crane and Sicily Dickenson, NRG’s CMO, call “the power behind the plug,”  so as long as prices aren’t affected, nothing about NRG’s power sources would affect the behavior of consumers (leaving out the effects of marketing). In order to understand NRG’s rationale for overhauling its energy sources and the effects of its sustainability plans on performance, we must analyze several deeply embedded factors, including the culture of the company, the values promoted by its leadership, and a fragmented and unreliable policy environment, as well as the broader sentiment of investors and whether they’re ready for an activist-CEO in the energy space. Despite being relatively young (only 26 years old), NRG is one of the largest companies in its industry, supplying energy to around forty million homes across the United States and operating in all fifty states and the District of Columbia. It does so with just under ten thousand employees. In 2006, the proportion of its product coming from renewables was effectively none. The company had started investing in new wind projects, but had only about 300 MW of generating capacity. By comparison, it was generating 1,100 MW of nuclear power, 3,555 MW from oil, 7,815 MW from coal, and 10,470 MW from natural gas, for a total of 22,940 MW nationwide. Renewables formed a negligible component of the power it generated. That was in 2006—when NRG produced less than half the power it does today. When the Obama administration began a few years later, the policy environment changed significantly. Federal subsidies for renewables nearly tripled, from $5.1 billion to $14.7 billion between 2007 and 2010. Of those subsidies, federal tax credits accounted for $4.13 billion in 2007 and $8.17 billion in 2010,  approximately doubling during those three years. By 2011, NRG was ramping up its efforts and fully committed to renewables, with David Crane asserting in the New York Times that “we intend to do as much of this business as we can get our hands on.”  Along with partners, NRG was able to acquire more than $5.2 billion in federal subsidies and loans for utility-scale solar power—and that’s just one example. It isn’t particularly surprising that NRG effectively had no renewable power generation in 2006. Most sources were underdeveloped. The cost of solar power was around $5/watt, far higher than it is today. Solar power was getting cheaper, but the cost didn’t start to fall rapidly until around 2008. (By 2013, the price of solar power had decreased to $0.74/watt.) At the time, module prices were also on the rise due to a short-term silicon shortage. The rapid global rise in solar power that we can see today wasn’t especially easy to predict back then. A partial goal of these projects was to force a transition from carbon-intensive fossil fuels to renewables, nuclear power, and natural gas. One of NRG’s main sustainability goals is to reduce its company-wide emissions by half by 2030, and by 90% by 2050. A company less interested in the effects of climate change would perhaps have been satisfied with maintaining varying proportions of coal, oil, natural gas, and nuclear power without taking on the substantial risk of investing in and scaling up solar and wind projects in an unreliable policy environment. Capital-intensive energy infrastructure projects are expensive and it takes time to see results. In other words, NRG’s renewable projects come at a significant risk to performance in the short-term, and the company was taking a bet on the long-term results outweighing those risks. As far as generating capacity goes, the results have put NRG on target to achieve its long-term renewable energy goals. The company has increased its production from wind power by five times, and grown to become the third-largest generator of renewable power in the United States. It has also invested in deploying a network of electric car chargers called “eVgo” that has grown in customer acquisition by 20 times, and it plans on deploying eVgo to 25 more major cities by 2018. Perhaps most importantly, renewable power now accounts for 4,259 MW of generation, or 8% of its total—compared to effectively none less than a decade ago—the overwhelming majority of which comes from wind and utility-scale solar. When NRG started to expand its investments into renewable energy, it was only because the policy environment and resource prices allowed for it. It’s worth noting that this is the fundamental pillar of any corporate sustainability effort that goes beyond old-style CSR and truly integrates across the whole company. Business can only be a sincere force for good in the world as long as regulations, economics, and business incentives align. It may be morally unsatisfying (even if predictable) that a company would only invest in socially beneficial measures if it suits its business agenda, but the flipside of that is that any measures that aren’t financially sustainable are nothing more than charitable extensions that aren’t connected to the core of the business, and thus are impossible to reliably scale. Therefore, a corollary is that when the business incentives do align with the opportunity to integrate environmental sustainability into the fabric of the company’s work, it could have a much bigger impact. In NRG’s case, millions of homes could become powered by clean energy. His leadership in a particularly obstinate industry is laudable, but NRG still has to reconcile a purpose-driven mission with the realities of running an energy company. That means producing and transmitting electricity at the lowest cost and keeping capital expenditures under control, among a host of other complexities. In aggressively growing its renewables portfolio, NRG had subjected itself to a constantly changing policy environment, a situation that makes it hard to foresee future costs, and this instability left the company potentially more exposed to unforeseeable risks than its competitors. Investors noticed. While renewables have benefited from growing subsidy support in the United States,  federal climate and energy policy is fragile. Many of the substantial policy changes supporting the long-term future of renewables are based on executive authority, and therefore tied to domestic politics. Consequently, the United States has generally struggled to keep up with global investment flows into the sector. Annual new investment into renewable power and fuels in the United States has varied between $29.1 and $50 billion since 2006, but there hasn’t been reliable growth in these investments in the last eight years. The rest of the world has left the United States behind. In 2006, U.S. investment into the sector accounted for around 26% of the global total—by 2014, this share had decreased to 14.2%. In the same time period, China’s investment into renewable power and fuels increased from just over one third of what the United States was spending ($11.1 billion vs. $29.1 billion) to more than double ($83.3 billion vs. $38.3 billion). These numbers reflect the fragility of American energy policy and reveal a rift between NRG’s tactic of aggressive growth in renewables, and the wider sentiment on their potential in the United States in the short term. The unpredictable nature of American energy policy makes it hard to tell whether R&D and other investments into renewables will increase substantially and reliably in the near future. While tens of billions of dollars are nonetheless flowing into the sector each year, NRG remains relatively isolated in its moral compass, at least among established energy companies. The fact that American energy policy seems anchored in traditionally unwavering support for fossil fuels (the U.S. government has not begun to phase out its fossil fuel production subsidies) makes it difficult for a company like NRG to depart drastically from conventional fuels without signaling a significant risk to investors—who tend to dislike uncertainty. When all of these factors are taken into consideration, can NRG’s efforts be considered successful? NRG Yield has also failed, as far as investors are concerned. Designed as a growth engine for the company, investors began to doubt the possibility that it could continue to sustainably fuel an acceptable level of dividend growth. Consequently, NRG Yield’s own stock price (NYLD) has decreased precipitously, to less than a third of what it was at the beginning of the year. 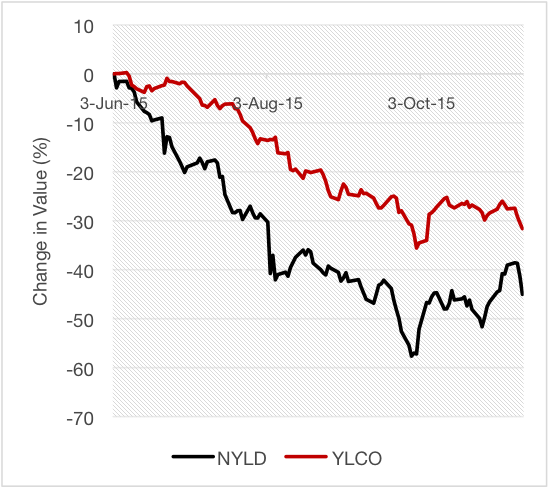 Broader fears around the risk profile of Yieldcos have also risen, so NRG Yield isn’t especially unique in facing this problem, but NYLD has even significantly underperformed compared to the Global X YieldCo ETF Index (an index made up entirely of yieldcos, including NYLD) (Figure 3). Regardless of the financials, questions of the wider societal impact of NRG’s projects still remain. Renewable power generation of 4,259 MW sounds like a lot, especially when compared with almost none only a few years ago. But 8% of NRG’s generating capacity coming from renewables also means that 90% still comes from high-carbon conventional fuels (the other 2% coming from nuclear). And the increase in NRG’s generating capacity from 22,940 MW in 2006 to 53,470 MW today indicates that there’s a whole other story that isn’t being told about the side of the company that generates high-carbon power. While nuclear power has negligibly increased in capacity (1,100 to 1,176 MW), capacity from oil has nearly doubled (3,555 to 6,008 MW), natural gas has increased by more than 2.5 times (10,470 to 25,301 MW), and even coal has more than doubled (7,815 to 16,734 MW). To put that into perspective, NRG’s absolute increase in fossil-fuel-generating capacity is more than five times its increase in generating capacity from renewables. Mr. Crane believed that investors would tolerate his purpose-driven renewables strategy partly because he had also invested so heavily in conventional capacity increases. Not only was he wrong (they didn’t tolerate his strategy), but he also faced pressure to take action to satisfy shareholders, leading NRG to make the decision to spin off its renewables arm, while limiting investment in clean energy projects to a restrictive $125 million. This raises the important question: What do investors see as a success, compared to NRG? It comes down to a clash of values. As a corporate leader, Mr. Crane has two separate missions: one related to the operation of the business, and another related to the influence that his business could have on society. The potential for a large energy company to exert this influence is huge—it could choose how it generates electricity and in turn remove the burden of responsibility from the consumer. However, since energy is the core of its business, its social mission must also align with the realities of operating a public company. Markets respond brutally to short-term failures. In NRG’s case, its spending didn’t match with results, and it has been punished harshly by stakeholders. In fairness to Mr. Crane and the NRG management, there are many factors out of their control when they invest for growth in renewables. However, integrating a social mission into the core business of a company is different from rendering a large corporation more sustainable. The challenge is harder for an energy company. For many organizations, integrating sustainability, while a difficult and complex task, is usually somewhat peripheral to the product it sells. NRG was trying to address the risks of climate change by substituting the product it sells, and in doing so had to take a significant gamble with investors, on which there was no safety net. The case of NRG may present a valuable lesson. Its stock performance issues raise questions about whether the private sector is ready for an investor with socially oriented values, and while Mr. Crane is a veteran executive and has been leading NRG for over a decade, he was eventually forced to drastically scale back his ambitions for renewable generation in order to save the performance of his company. It’s fair to say that NRG is a good example of how a company can be punished and limited even when its senior management is dedicated to using their resources to solving a particular problem. And while the use of renewables is growing rapidly around the world, the U.S. power sector hasn’t addressed important questions of storage and transmission, as well as other complexities that are involved in moving the United States to a low-carbon power supply. Furthermore, the case of NRG demonstrates the challenges individual actors in the energy industry face, despite the improving prospects for an economy-wide transition to low-carbon power. Measures that both reduce carbon emissions and boost economic growth are becoming increasingly available and attractive to investors. The 2015 New Climate Economy Report (a study of the Global Commission on the Economy and Climate) showed that action in 10 “areas of opportunity”  that would deliver economic benefits (in other words, investments that would be defensible regardless of the effect of climate change) could account for 96% of the emissions reductions necessary to keep global warming below the 2°C threshold agreed upon at the UN climate summit in 2009. However, this seemingly serendipitous alignment of interests clouds the challenges faced by executives in individual firms. CEOs in the energy industry that rush the transition in order to align with the urgency of the threat of climate change stand to be punished by stakeholders who place less value on those solutions. In NRG’s case, redirecting revenue into growth businesses was a risky move, and when the results underwhelmed stakeholders, the business suffered. In the broader context of the climate change issue, this case can help illustrate the pitfalls of expecting that a cost-benefit assessment alone will be enough to accelerate the scaling of low-carbon power. While it’s true that the aggregate cost of inaction is widely agreed to exceed the cost of action,,  and that there are opportunities to make money in low-carbon growth, many institutional investors and individual shareholders remain unsympathetic to the long-term view and respond unkindly to short-term performance failures. This exposes a fundamental challenge that has yet to be adequately addressed: the power of the private sector’s short-term bias. While an in-depth analysis of the effects of this problem is beyond the scope of this paper, the experience of NRG does have significant implications for even the most socially responsible companies. There remains a serious disincentive for companies to invest in the measures that could produce financial benefits in the long term, simply because shareholders hold power in the company’s decision making (as evidenced by NRG’s decisions to cap internal spending on growth projects and spin off their renewables arm). This problem is not limited to the scaling of a low-carbon power supply. The broader reluctance to undertake measures that involve up-front costs has been a serious challenge to the development of any industry-led projects that could reduce carbon emissions. 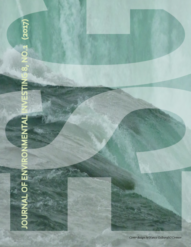 Improvements in energy efficiency could account for a decrease in greenhouse gas emissions of 5.7 GtCO2e per year by 2030 (the study cited provides a range, of 4.5 to 6.9 GtCO2e), and these measures have the added benefits of being universally desired and avoiding the difficulties involved in facing a powerful fossil fuel industry. However, improving the efficiency of buildings and industrial processes requires significant upfront investment, which could be penalized by corporate stakeholders with a shorter-term view than the company’s management, similar to the way in which NRG was punished. As such, even organizations interested in the long-term savings that come with better energy efficiency may not be able to justify to their stakeholders the investment required, especially when supporting government policy is underdeveloped and unpredictable. Given the context, therefore, an important question is how the private sector can be incentivized to participate on a larger scale in developing solutions that address climate disruption. Here, there may be a role for intelligently designed government policy. Regulations can help to level the playing field for whole industries (in this case, energy) so that stakeholders don’t penalize CEOs who take advantage of opportunities for long-term growth. While the purpose of this paper is not to advocate specific policy measures (the requisite analysis has not been performed), numerous proposed solutions could be effective. Carbon pricing has gained momentum as a potentially powerful mechanism for accelerating the transition to a low-carbon world, and has been embraced by experts. The current landscape of carbon pricing initiatives is fragmented and many existing policies are weak, but this may change. The world has learned from the problems that plagued the launch of Europe’s emissions trading system (ETS) in 2005. Some regional programs have proven successful: A study from the Analysis Group calculating that the Regional Greenhouse Gas Initiative (U.S. Northeast) had produced $1.3 billion in net added economic value while saving consumers around $460 million in heating and power costs over three years., and China will launch its own in 2017. In the end, NRG’s challenges demonstrate that even when the criteria are met for a company to invest in solutions to issues like climate change, it can run into resistance. A range of factors allowed NRG to make significant investments in renewables, but one CEO taking a moral stand is not sufficient if the rest of the industry remains obstinate and if shareholders are resistant. As for its current predicament, the company must now decide between limited options. 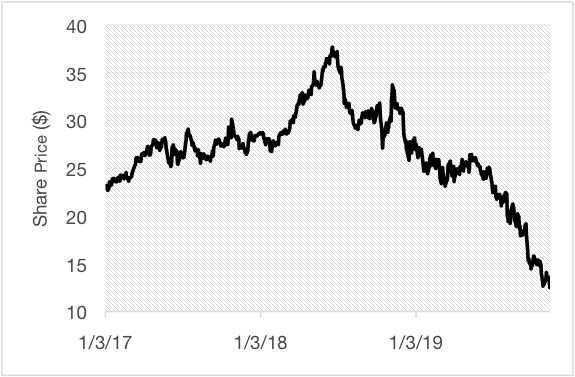 NRG’s stock price continued to decline after Crane announced its new strategic direction; at the end of 2015, David Crane stepped down from his position as CEO of NRG and was replaced by Mauricio Gutierrez. His departure from NRG reflects the rift in values that may prevent progress on the evolution of clean energy, even when executives make ambitious efforts in that direction. Nonetheless, the company’s revised strategy of spinning off the renewables arm should not be dismissed. Separating the renewables arm of the business allows institutional investors and others that don’t care as much about the moral implications of their investment to keep their stake in the part of the company that better suits their interests. Furthermore, a rising number of investors are interested in investments that are exclusively socially beneficial, and a newly formed renewables spin-off can appeal to those that were previously hesitant to invest in a provider that earned the overwhelming majority of its revenue from burning fossil fuels. Parker Liautaud studies geology and geophysics at Yale University. His work focuses on exploring policy solutions to climate change. From April 2014 to October 2015, he was a fellow and member of the directorate at the Yale Climate & Energy Institute. He has been invited to speak on climate issues at a range of institutions, including the World Economic Forum (2015), the World Bank (2015), the White House (2014), and the Clinton Global Initiative (2014 Annual Meeting). In December 2013, he was named to Time Magazine’s 30 Under 30 list of people changing the world.
. David Jones. 2011. Who Cares Wins: Why Good Business is Better Business. Financial Times Press.
. NRG Energy. 2015. 2014 Annual Report. Retrieved from http://investors.nrg.com/phoenix.zhtml?c=121544&p=irol-reportsannual.
. Rebecca Smith. November 2015. “NRG Chief’s Green Ambitions Are Put on Back Burner.” Wall Street Journal. Retrieved from http://www.wsj.com/articles/nrg-energy-ceos-green-ambitions-are-put-on-back-burner-1446592145?ru=yahoo?mod=yahoo_itp&cb=logged0.34269569255411625.
. Yahoo Finance. 2015. NRG Energy, Inc. (NRG) Stock Tracker. Retrieved from http://finance.yahoo.com.
. Yahoo Finance. 2015. NRG Energy, Inc. (NRG) and S&P 500 Stock Trackers. Retrieved from http://finance.yahoo.com.
. Yahoo Finance. 2015. NRG Energy, Inc. (NRG) Stock Tracker.
. NRG Energy. 2015. “Have You Ever Thought about the Power behind the Plug?” Retrieved from http://revolution.nrg.com/.
. NRG Energy. 2015. 2014 Year in Review. Retrieved from http://investors.nrg.com/phoenix.zhtml?c=121544&p=irol-reportsannual.
. NRG Energy. 2007. 2006 Annual Report. Retrieved from http://investors.nrg.com/phoenix.zhtml?c=121544&p=irol-reportsannual.
. U.S. Energy Information Administration. 2010. Direct Federal Financial Interventions and Subsidies in Energy in Fiscal Year 2010. Retrieved from http://www.eia.gov/analysis/requests/subsidy/archive/2010/pdf/subsidy.pdf.
. Eric Lipton and Clifford Krauss. November 2011. “A Gold Rush of Subsidies in Clean Energy Search.” The New York Times. Retrieved from http://www.nytimes.com/2011/11/12/business/energy-environment/a-cornucopia-of-help-for-renewable-energy.html?_r=0.
. Zachary Shahan. September 2014. “13 Charts on Solar Panel Cost & Growth Trends.” CleanTechnica. Retrieved from http://cleantechnica.com/2014/09/04/solar-panel-cost-trends-10-charts/.
. NRG Energy. 2014 Annual Report.
. NRG Energy. “Our Companies.” http://www.nrg.com/about/who-we-are/our-companies/.
. NRG Energy 2014 Year in Review.
. NRG Energy. 2015. “David Crane: President and Chief Executive Officer.” Retrieved from http://www.nrg.com/about/our-management/david-crane/.
. Christopher Helman. July 2014. “David Crane’s Green Vision for Carbon-Belching NRG Energy.” Forbes. Retrieved from http://www.forbes.com/sites/christopherhelman/2014/07/02/david-cranes-green-vision-for-carbon-belching-nrg-energy/.
. U.S. Energy Information Administration Direct Federal Financial Interventions and Subsidies in Energy in Fiscal Year 2010.
. Renewable Energy Policy Network for the 21st Century (REN21). .2015. Renewables 2015 Global Status Report. Retrieved from http://www.ren21.net/wp-content/uploads/2015/07/REN12-GSR2015_Onlinebook_low1.pdf.
. Stephen Lacey. 2015. “NRG Will Spin Off Its Clean Energy Business: Investor Pressure, or a Bet on a Green Premium?” Greentech Media. Retrieved from http://www.greentechmedia.com/articles/read/under-pressure-from-investors-nrg-restructures-clean-energy-business.
. Yahoo Finance. 2015. NRG Yield, Inc. (NYLD) Stock Tracker. Retrieved from http://finance.yahoo.com.
. Mercatus Analytics. 2015. Distributed Energy Insight Report. Retrieved from http://pages.gomercatus.com/rs/432-MVH-269/images/Insight%20Report%20%28Final%29.pdf?aliId=479714.
. Yahoo Finance. 2015. NRG Yield, Inc. (NYLD) and YieldCo Index ETF (YLCO) Stock Trackers. Retrieved from http://finance.yahoo.com/.
. NRG Energy. 2014 Annual Report, and 2006 Annual Report.
. The Global Commission on the Economy and Climate. 2015. “Executive Summary.” Seizing the Global Opportunity: Partnerships for Better Growth and a Better Climate: The 2015 New Climate Economy Report. Retrieved from http://2015.newclimateeconomy.report/wp-content/uploads/2014/08/NCE-2015_Exec_summary_web.pdf.
. DARA. 2012. Climate Vulnerability Monitor, Complete Report. Retrieved from http://www.daraint.org/wp-content/uploads/2012/10/CVM2-Low.pdf.
. Economist Intelligence Unit. 2015. The Cost of Inaction: Recognizing theValue at Risk from Climate Change. Retrieved from http://www.economistinsights.com/sites/default/files/The%20cost%20of%20inaction.pdf.
. Partnership for Market Readiness. 2013. “Carbon Pricing to Achieve Mitigation: Remarks from Rachel Kyte.” Retrieved from https://www.thepmr.org/content/carbon-pricing-achieve-mitigation-remarks-rachel-kyte.
. International Carbon Action Partnership. 2015. “China to Cap Emissions from Six Sectors, ETS to Launch 2016.” Retrieved from https://icapcarbonaction.com/en/news-archive/268-china-to-cap-emissions-from-six-sectors-ets-to-launch-2016.